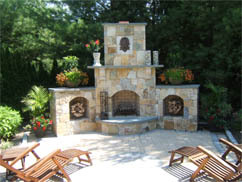 From full Brick Veneers to Stone Walls, Patios, Walkways, Fireplaces and much more. Halls Masonry is a family business handed down from generation to generation. We have over 30 years of providing superior quality masonry services to Rhode Island and the nearby communities in Massachusetts and Connecticut and are accredited with the Better Business Bureau. We work with both commercial and residential properties and our breadth of services, including many complimentary services we can offer through select partnerships and associations with other quality companies, are second to none. We encourage you to view some photos of our work in our Project Galleries. You can also take a look at the range of Services We Offer. Please contact us with any questions you may have or to schedule a time for us to visit your property for a free, no obligation estimate.